There is nothing new under the sun. Yet as we evolve there are instances that cannot otherwise be described as egregious. Numero, an international fashion magazine which offers avant-garde views of the world of fashion, art and luxury, has wowed us in their recent display of an African Queen. 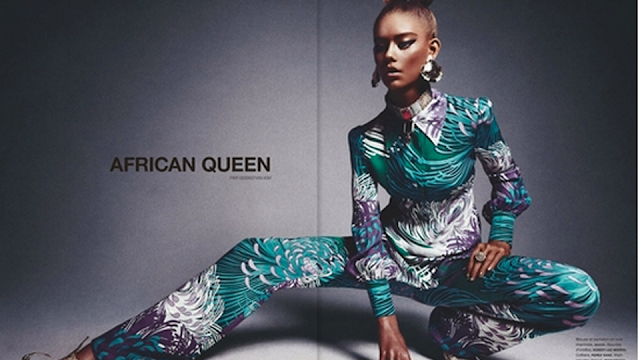 Chosen to grace the pages of Numero as an African Queen is 16-year-old caucasian model Ondria Hardin. Drenched in deep bronze the model strikes a pose in an effort to depict a women of African descent. Ok, I know this is not new to us...since Elizabeth Taylor played Cleopatra but were there no real black models available for the shoot? Foudre says "...why hire a black model when you could just paint a white one!"